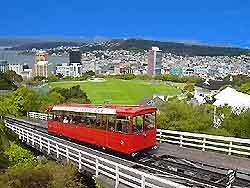 There are many different ways to sightsee in Wellington, with guided bus tours of the principal tourist attractions connecting the harbourfront, the Kelburn Cable Car and the Oriental Parade. Walking tours provide an altogether more leisurely way to explore the city, while further options include helicopter trips, balloon flights and cruises along the coastline. Many sizeable theatres grace the streets of Wellington and provide a choice of evening entertainment possibilities. Situated in the city centre and alongside the Te Aro Park, the State Opera House is especially notable and dates back to the early 1900s, when it was amongst the most impressive buildings in the area. Further tourist attractions in Wellington include the historical charm of Ascot Street and also the planetarium at the Carter Observatory, while both Mount Kaukau and Mount Victoria provide superb panoramas, appealing walking trails and many further recreational activities. At the natural inlet named the Porirua Harbour, water sports and wildlife are the main draws. Wellington's bus and coach tours are one of the best ways to do some serious sightseeing in the city and take in many of the most impressive sights and major tourist attractions. With informative commentary from experienced guides, these bus tours feature bright yellow double-decker buses with open tops and regularly depart from a number of central locations, including Courtenay Place, Civic Square, the Parliament Buildings and the Beehive. Operated by the City Council, 'Walk Wellington' guided walking tours depart from Lambton Quay each day and offer a real insight into some of the city's most famous buildings and monuments. With different packages, including group and speciality walking tours, guided walks can be booked at the main tourist information and visitors' centres. 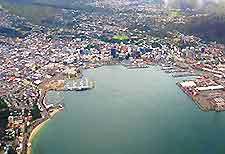 Helicopter tours of the city are available at the nearby Wellington International Airport and close to the Lambton Quay area (at the Queens Wharf Heliport), and are one of the best ways to view the harbour and city centre. Providing incredible views of both the cityscape and the surrounding countryside, helicopter flights are fairly flexible and vary in length. Balloon Flights are an extremely memorable way to view the Wellington area and surrounding countryside. Departing from the Wairarapa region, these balloon rides provide magnificent panoramic views. Flights last around one hour and are always very much dependent upon fine weather. 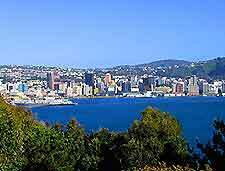 Wellington operates a number of popular cruises around the city's coastline, particularly in the harbour area, with exceptional views of the skyline. Other cruises include day trips and longer excursions to nearby islands, including New Zealand's South Island - which can be reached in around three hours, and Somes Island - with a number of historic sightseeing opportunities. Cruises around the harbour and beyond provide an ideal way to observe native wildlife. Many different boats operate in the area, such as lunchtime cruises with extensive buffets, guided tours with informative commentary, and evening trips with gourmet dinners and music. The Kelburn Cable Car is a Swiss-built funicular railway that climbs to the main Kelburn Terminal, offering some truly spectacular scenic views of the city and Port Nicholson, usually known simply as Wellington Harbour. Connecting Lambton Quay with the Kelburn district, the cable car runs every ten minutes throughout the day, with the journey lasting around six minutes. Home to regular theatrical performances, including plays, ballets, comedy events, concerts and of course, operas, this proscenium theatre is a popular attraction for tourists visiting the city. The city's State Opera House is capable of seating audiences of just over 1,350. Established in the late 1930s, the centrally located Carter Observatory is situated to one side of the Botanic Gardens, where it is home to powerful telescopes, detailed astronomy exhibitions and a large planetarium, offering regular entertaining shows about the universe. The observatory is highly suitable for all the family and also hosts frequent evening and nighttime star-gazing events. Of note, a major refurbishment programme costing in the region of NZ$5 million was completed in 2010. A walk down Ascot Street is rather like a walk back in time. Full of historic buildings, this stretch is rich in local heritage and features numerous 19th-century structures. The street can be found in the Thorndon district and is well worth a visit. The Enormous Crocodile Company hires a range of different bicycles, including side-by-side 'Crocodile' bicycles, with room for up to six adults and children. These bikes are particularly popular with tourists visiting the city and can be hired for just 30 minutes or by the hour. Mount Victoria (Tangi Te Keo in Maori) has always been one of the city's most striking natural attractions and offers spectacular panoramic views across the city and its harbour. With walking and driving trails, this prominent hill is the perfect spot for the ultimate scenic picnic. Lord of the Rings film buffs will know that this suburb featured as a location in the film trilogy no less than twice. Standing in northern Wellington, alongside the suburbs of Johnsonville and Khandallah, Mount Kaukau is favoured by locals and contains a number of challenging walking trails, rewarding visitors with magnificent views of Wellington and beyond. On a clear day, it is even possible to see the coastline of New Zealand's South Island from the very top of the mountain. Of note, the summit reaches a height of just under 450 metres / 1,476 feet and is crowned by the 100-metre / 328-foot Kordia TV Mast. 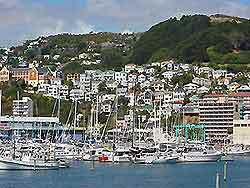 Porirua Harbour is situated on the far northern side of Wellington and is actually the city's original harbour. Home to a host of exciting water sports, walking trails, off-shore fishing and sightseeing cruises, this spot contains a number of scenic bays and comes with many major recreational attractions. The Pauatahanui Wildlife Reserve is a particular highlight here and was established to help preserve the rich wildlife present around the inlet. 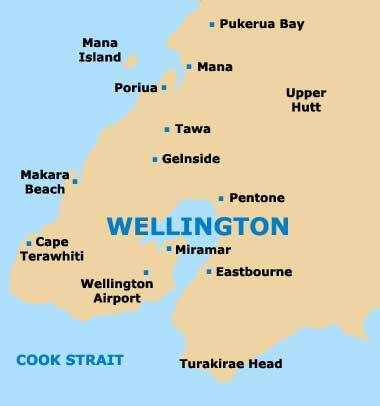 Wellington has many exceptional theatres and entertainment venues, both located in and around the city centre. Regularly hosting popular musical performances, theatrical events, comedy gigs, family shows, rock and classical concerts, ballets, and operas, there are always plenty of things to see at the city's theatres.